I’ll also send you my Practical NLP audiobook FREE to thank you for subscribing. Do you want to find out how NLP can help you make your life and work better? be more effective in your work, life, and relationships! As well as show notes for each Practical NLP Podcast episode, this blog gives you tips, techniques, book reviews and other interesting stuff about NLP. Choose a category that interests you or search on the keywords you’re looking for. 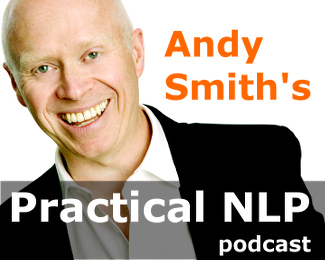 Download NLP knowledge products by Andy Smith: exercise packs and manuals for trainers, personal development audio, podcast back episodes, and other downloads, some of them free, at the Practical NLP Podcast online store. If you’re ready to take the next step in your NLP journey and get trained, you can take an NLP Practitioner training in the UK with me. I also provide shorter courses for corporate clients, including Effective Communication Skills with NLP and NLP and Coaching Skills Foundation.